Eating out with an allergy or coeliac disease is a challenge. If you have multiple allergies it becomes even trickier. Not only do you need to communicate the severity of your allergy, you also need to discover what risks might be lurking in the kitchen. Do they understand cross contamination and the simple steps they could take to avoid them? Do the staff even understand what allergies, anaphylaxis, food intolerances and coeliac disease even are? The gap in knowledge is startling. You may find restaurants and pubs only too happy to oblige but have they really understood the severity and complexity of your situation? Do they really want to? One of the things we food challenged individuals do need to consider is that not all restaurants will either want to cater for us, nor wish to restrict their kitchen practises or flair. Chef’s enjoy their creativity in the kitchen – catering for allergies could seriously affect that. Waitrose Good Food Guide editor, Elizabeth Carter says “I have sympathy for people with allergies but it is about common sense. I just can’t understand why anyone with a life threatening allergy would play Russian roulette in a restaurant”. That doesn’t sound like a very sympathetic comment to me. Would it be acceptable to make the same bold statement about someone with another kind of disability? Someone who was blind for instance and needed help reading the menu or requested a braile menu. What about people who use a wheelchair; this disability is now widely recognised and the law now dictates that all new buildings must have disabled access. Will there ever be such a law that helps those with allergies get a simple and safe meal when eating out? Or will we be forced to stay at home like those with wheelchairs used to have to do? Or carry our picnic snacks around with us, something most allergic people are used to doing anyway. If Marth invites you to dinner it might be wise to politely decline or expect to go hungry and take along a snack in your handbag. To suggest all those with allergies should ‘stay at home rather than play Russian roulette with their allergies may sound like the ultimate solution and it is the decision most of us take after many embarassing and humilating experiences. But are we really being that unrealistic to expect some kind of service? Could a pub or restaurant not offer just a few options that could be cooked to a strict recipe, thereby ensuring the person with allergies is not left out and can dine happily with their friends and family? Could extra care be taken every now and then for the person living such a restricted life? Or should we all just stay safe and eat at home? 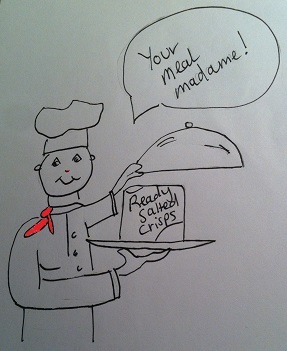 This situation was brought home to me after a recent experience eating at a local pub. A particular favourite of ours, but where I had experienced mild reactions (still not nice) after eating simple meals like ham, egg and chips or steak. Despite speaking to them about allergies and being told it would OK these reactions continued, but it was hit and miss. Sometimes it was all OK and other times causing a mild reaction. This wasn’t full on anaphylaxis so it was likely caused by tiny traces of allergen but you are never completely sure if it was the pub meal, something airborne or something you ate somewhere else earlier. So I used my new Dietary Allergy Card so that the staff and chef might gain a better understanding. The allergy card is a custom written dietary card to be used whenever you eat out. I’ve written this one myself, and it covers two sides of laminated A5 card. One side with details of what I’m allergic to and cross contamination concerns and the other explaining what I can eat. Until now I have had nothing but thanks and reassurance from chefs when I’ve used it. All of them saying it was so useful, really helpful and they wish everyone with allergies or intolerances had something similar. But this time it was like kitchen melt-down. For the first time the staff took note of what I was trying to ask them. Seeing the words in writing instead of a verbal plea was hard hitting and they suddenly ‘got it’. They understood the severity of my allergies and didn’t think anything on their menu would be suitable! 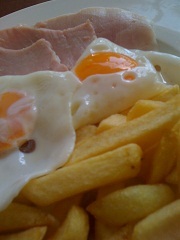 My tactic in pubs has often been to order ham, egg and chips and assume this would be OK. This was my first mistake. My mistake and not theirs. Even asking the waiter or waitress whether the meal contained any dairy, milk etc. is not enough. They checked and told me, “No there is no dairy in that meal.” becaust their wasn’t. At no point had I asked them about cross contamination or how they prepared the food. It seems like such an impertinent question. One that would make me feel very uncomforable, nosy and rude even to ask. One only really allowed by health and safety inspectors, but it’s the most important question of the lot. When you eat out YOU take the risk. So YOU have to make sure you ask all the right questions. It makes it so important to ALWAYS ask the right questions every time you eat somewhere, even if a previous meal went without a hitch. Never assume staff know what you mean. Never take risks and always err on the side of caution. Before I say any more I will just confirm that the meal I eventually ate was fine. I had no allergic reaction. But negotiating the meal felt like an epic verbal battle. I felt every bit the leper, freak, stay-at-home allergic moron as I had feared and really, truly wished we had stayed at home. By the time my food arrived after about four chats with different staff with varying degrees of sensitivity I had lost my appetite and was close to tears. The carefully worded allergy card seemed to envoke utter terror in the kitchen. This is what happened. Is the only really safe thing to eat in a pub a bag of ready salted crisps? The barman/waiter was respectful and helpful and took the card with him for the chef. I ordered a plain steak with peas (I never really want salad with a steak anyway) to avoid contamination from the salad bar. Another very friendly chap (spikey hair) came out to explain that the chips were cooked in oil that also cooked other breaded and battered food stuffs so would be off limits. I was impressed by this and thanked him for checking. So he said they could do me new potatoes. Brilliant! I love new potatoes. He also said the salad was not going to work so we again asked if peas would be an OK alternative? Yes it would. I didn’t point out I had already requested peas instead of salad. There seemed little point. So all was good. Spikey hair came out again and said the grill was used to flame-grill steaks and everything was grilled on there, including buns, tomatoes, things with cheese… so they couldn’t do me a steak. We asked if it was possible to just flash it in a pan instead of the grill. He said he would check but was already hinting that this would not be easy. It was a small kitchen… and I appreciate this but alarm bells are ringing in my head now and I am so grateful that we sat in the far back corner of the pub. Next came the burly owner. Spouting all sorts of nonsense about how it was ‘against the law because they served peanuts on the bar and that peanuts were airborne’. This conversation went on for some time, he wasn’t happy to take the risk and had clearly been sent as the bearer of bad news. The chef wasn’t happy taking risks in case I got ill. So we asked for just the moussaka and a packet of ready salted crisps please. By now this was really all I wanted. My appetite was dwindling. The owner returned with more conversation about how ‘It was against the law for them to serve me. Blah, blah, blah. They couldn’t take that risk and nor should we.’ This went on and on. I have no idea what he was talking about but I got the message. At this point I was getting upset. I had now totally lost my appetite and wanted to leave but my husband was starving. He started to negotiate with owner using words like ‘could you rest the steak on silver foil on the grill?’ and ‘we know you have allergens and we know it’s a risk to eat here and all we want to do is ensure you understand and can take care when preparing my wife’s food’… Some kind of truce was called and he went back to the kitchen. At this point I had kind of retreated inside myself. I was looking down at the table and not joining in the conversation. I should have been paying attention and remaining alert but I just wanted to leave. I didn’t even want to be there any more. I just wanted to go home. Eventually my rib-eye steak arrived with new potatoes and peas. I ate it and I didn’t have any kind of allergic reaction, clearly there was no cross contamination, but I didn’t enjoy that meal. The steak was melt-in-the-mouth amazing but my head was spinning with what had just happened. I am still upset. This is a pub we have been visiting for years, sometimes more than once a week. They know our names. The recognise us. I usually order the steak, the most expensive dish on the menu and we have a few drinks. I am not sure whether we will go back now. This does make me very sad but I no longer feel at all welcome there. I am terrified of returning. I was mortified and was actually crying at one point while eating this meal that we practically had to beg for. Looking back we should have left. They were clearly totally unprepared and unable to work out what to do about me. This makes me very sad. But it does explain the mysterious asthma and mild reactions. I take some of the blame here because I wasn’t communicating clearly enough. Despite telling them about my allergies and asking them to check whether my meal would be dairy and nut free in the past, this verbal conversation was clearly not enough. It took the written allergy medical card for them to take it seriously and clearly the chef then realised how dangerous their kitchen might be and wasn’t happy to take that risk. This is actually a really good thing. At least, if nothing else, it has made them assess their kitchen with a critical eye and identify all the potential areas for allergen hazards. It is a big lesson for me in how just turning up somewhere, even somewhere you think will be able to provide you something, that verbal communication can fall woefully short when it comes to really getting to the bottom of cross contamination. It also proves that having a written, politely worded communication to show to staff really, really helps to get the message across. I would suggest sending this before hand if it’s a special meal or even visiting in person to speak to a chef and hand over a copy of your diet card for them. There is clearly a huge need for training and education about how to cater for those with allergies, and what allergies really mean. But then, maybe not every establishment has to cater for us allergy types. Are small busy pubs with small kitchens just a really bad idea for someone with multiple life threatening allergies? Why do we want and need to eat out? Eating out is a huge part of our social lives these days. Grabbing a coffee, meeting friends for lunch, buying a sandwich on the go and invitations to dinner and meals at restaurants etc. To consider a life devoid of ever going out for a drink, a bite to eat or a meal is not one many would relish. Even if you love cooking, having to prepare every meal you eat from scratch at home can be exhausting; having someone cook you a meal is a treat. You can relax, enjoy the food and spend good quality time with friends and family. The person with allergies finds this easy spontaneous enjoyment almost impossible. Eating out is a constant minefield which requires early military planning. You never really relax and are constantly on the lookout for potential hazards. To suggest that we should all stay at home is thoughtless and unhelpful. There are loads of restaurants, pubs and cafes that do seem to be able to grasp what’s required and provide a safe and tasty meal e.g. Nando’s, Pizza Express, Leons and Jake’s Cafe. The challenge is finding out where these special caring places are, sharing that information and growing the number, the understanding and willingness to learn and help the allergic diner. Until you have been refused at a restaurant or been told by a member of staff that ‘it’s against the law for them to serve you’ it’s hard to understand how that feels. From someone who has been there, it’s embarassing, mortifying and hard to take. We certainly do not ever want to be made to feel as uncomfortable as I felt that night. Despite the staff being very polite and friendly and the eventual meal being perfect, it was very difficult for them and for me and doubt they want to repeat the experience any more than I do. I hope it may help anyone else with allergies who might visit that pub. Maybe now they will be made aware of all the potential cross contamination levels. Let’s face it, there were way to many to consider eating there again really. All we want to do is be able to socialise with our friends and family. We don’t expect every meal on the menu to be available to us and for chefs to bend over backwards to provide us a gourmet experience. But a simple steak really ought to be no problem for a chef to prepare with no allergens. We certainly do not ever want to be made to feel as uncomfortable as I felt that night. Despite the staff being very polite and friendly and the eventual meal being perfect, it was very difficult for them and for me and I doubt they want to repeat the experience any more than I do. I left the pub with my head down, hiding. I felt small. I felt ridiculous. I felt unwelcome. I felt like everyone in the pub had heard and been watching although I doubt this was actually the case, just my imagination working on overdrive. We just want some kindness, understanding and a little bit of effort to give us something simple and safe to eat with minimal fuss. We just want to be like every other customer and enjoy a quiet meal.